Workers' faculties (robitnychi fakultety or robitfaky). 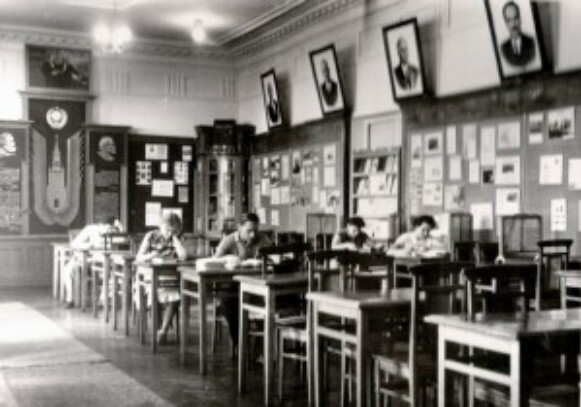 General education schools for adults in the USSR that were designed to prepare students for institutions of higher education and at the same time train politically dependable cadres. Both daytime (three-year) and evening (four-year) programs were available. Established in Moscow in 1919 and in the Ukrainian SSR in 1921, the faculties were jointly operated by higher educational institutions and the government commissariats in charge of different sectors of the economy. The faculties were limited to workers and peasants nominated by Party, Komsomol, and trade-union organizations. Admission requirements were minimal: the ability to read and write, the ability to perform the first four arithmetical operations, and a basic understanding of political developments. Although the academic background of students in these faculties was poor, almost all graduates of the program could transfer (without entrance examinations) into regular programs in institutions of higher learning. In 1929 workers' faculties in the Ukrainian SSR had 14,553 students, of whom 51.8 percent were Ukrainians and 24.1 percent were Russians. Members and candidate members of the Communist Party represented 35.8 percent of the total enrollment, Komsomol members, 38.6 percent, and students not belonging to the Party, 25.6 percent. Ukrainian was the language of instruction in 62 percent of the workers' faculties. The faculties were closed in 1940. In 1969 workers' faculties were reopened at institutions of higher education to educate working-class and peasant youths who had completed secondary-school education, and demobilized army personnel.